Home › FAQ › When Should You Take the LSAT? If you are considering law school, you are probably wondering when to take the LSAT, or the Law School Admission Test. This test, a prerequisite for admission to most law schools, is an important part of your application portfolio. This article provides an overview of what the LSAT is, how to prepare for it, and when to take the test. The LSAT is a standardized test used in admissions decisions for most law schools in the United States. The Law School Admission Council (LSAC) administers the test, which consists of five multiple-choice sections and one essay. Only four of the five multiple-choice sections are actually scored. The LSAC converts raw scores to a scale with 180 representing a perfect score on the exam. Top law schools typically look for applicants with scores above 170. Generally speaking, the LSAT tests skills rather than knowledge. In particular, the goal of the LSAT is to identify people with strong skills in the areas of logic and reasoning. The multiple-choice sections of the LSAT test reading comprehension, logical reasoning, and analytical reasoning. Each scored exam will consist of one reading comprehension section, one analytical reasoning section, and two logical reasoning sections. The unscored multiple-choice section on each exam is an experimental section used to develop future exam questions. Importantly, test takers do not know which section of the exam is unscored. The reading comprehension section of the LSAT contains lengthy passages followed by blocks of questions pertaining to each passage. These questions are typically fairly straightforward, although test takers may need to draw inferences from material in the reading passages. The logical reasoning sections test your ability to make certain logical arguments. Blocks of questions typically address a very short set of arguments or facts and ask test takers to identify logical weaknesses or follow logical assumptions to their conclusions. The analytical reasoning section is commonly called the “games” section, although many test takers find this section to be the most challenging aspect of the LSAT. The so-called games establish a set of rules and a list of possible variables. Test takers must chart possible outcomes by using logic and deduction. 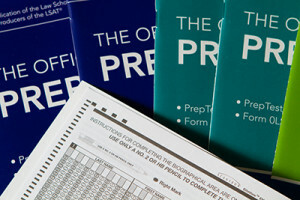 The best way to prepare for the LSAT is by taking practice examinations and studying past questions. Many LSAT preparation materials are available for purchase, and several private companies offer LSAT preparation courses. Taking and scoring full-length timed practice exams is the best way to estimate your eventual score. Many prospective law students wonder when to take the LSAT, which is offered four times per year. Law school admissions typically occur on a rolling basis until the winter or spring of each year. For this reason, it is possible to wait until the winter of an application year to take the exam. However, many people prefer to take the LSAT more than once in an effort to achieve the highest possible score. If you suspect that you will take the LSAT more than once, it is best to take it in the summer or fall of your application year. You should check with individual law schools to determine how they construe multiple scores; some schools request only the highest score, while other schools average all scores on record. The LSAC only permits test takers to take the LSAT three times per two-year period. Understanding the LSAT format and structure is an important step in preparing for the exam. It is also important to consult with your prospective law schools for score ranges of admitted candidates and policies on multiple exam scores. By considering each of these factors, you will ultimately be able to determine when to take the LSAT in order to maximize your score potential and law school candidacy.